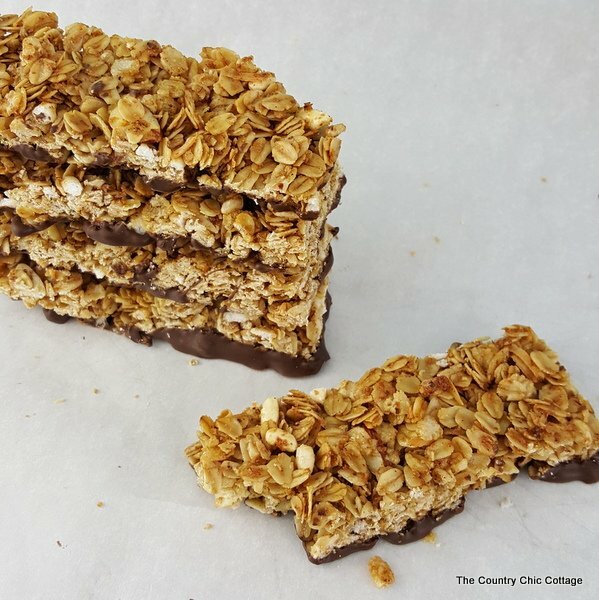 This chocolate dipped granola bars recipe will be your new favorite. Make them for your entire family cause y’all know that the kids will love anything dipped in chocolate. These simple granola bars are the perfect way to kick off the new year with a good for you recipe. Leave off the chocolate dip if you wish but it will make them extra tasty and extra enticing to the little ones. We all love Ree Drummond right? This chocolate dipped granola bars recipe is based off of her recipe here. There are a few changes though so follow the recipe below. In a bowl, toss the oats with the canola oil, cinnamon, melted butter and salt. Spread the mixture out on 2 baking sheets and toast in the oven for 15 to 20 minutes. Shake the pan occasionally to make sure the oats do not burn. Remove from the oven and set aside. In a medium saucepan, combine the brown sugar, honey, apple juice and agave. Stir while heating slowly until everything is combined. Stir in the vanilla and remove from the heat. Toss together the toasted oats, rice cereal, wheat germ, coconut and almonds. Pour in the sugar mixture. Be sure to stir as you pour. Toss to combine. The mixture will be very sticky. Dip the bottom only of the cooled granola bars straight into the melted chocolate. Set on parchment until set or pop in the refrigerator. 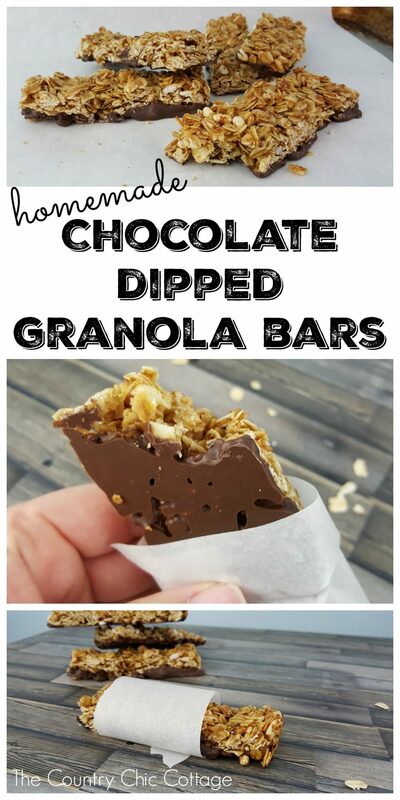 Your entire family will love this chocolate dipped granola bar recipe. Whip up a batch of these anytime for a go to healthy snack that they will be fighting over. Plus with a homemade version, you can control the quality of the ingredients and that is a win win! 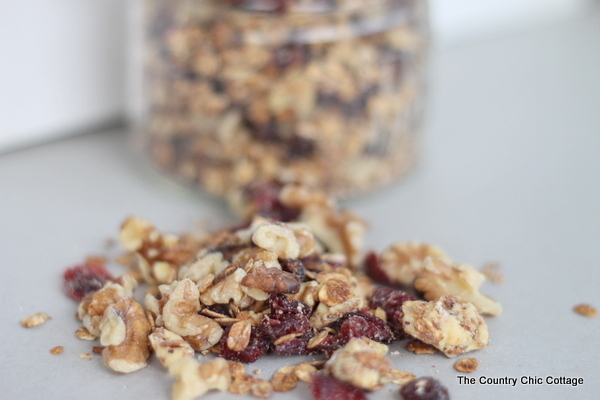 If you love this, you might also enjoy our cranberry white chocolate granola recipe here. You can also click here to check out our coconut almond granola recipe. These granola bars look so much more appetizing than the store bought variety. I’m pinning this recipe for the future! Thanks for sharing the recipe. 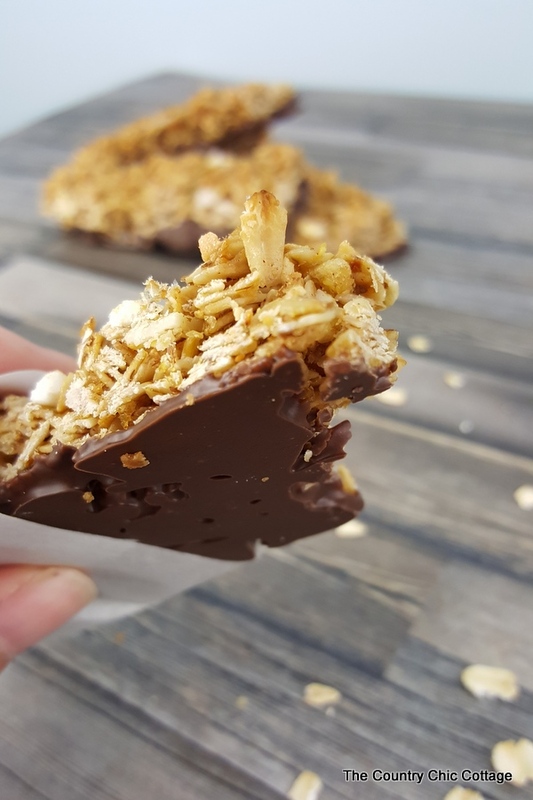 I love making my own granola – can’t wait to try these bars. These look amazing! I’m always looking for things to send my brother and granola bars are his favorite! Chocolate and Granola, a great combination! Thanks so much for sharing with us at Full Plate Thursday and hope to see you again real soon!